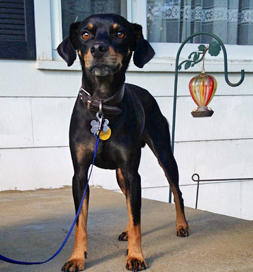 Pez’s former family relinquished him to Owensboro Humane Society in Kentucky, and though that was a sad development, it turned out to be just a bump on the road to a happy chapter in the Miniature Pinscher’s life. Pez is ready for some fun. Erin Vickery wanted a small dog and had been looking on Petfinder for several months. One day she decided to visit the shelter to see some of the dogs she’d been seeing on the website. “None of them really stood out, but then I remembered having seen [Pez] on Petfinder and asked to see him.” She also remembered that his previous family had given him up, a fact that broke her heart. She took him out for a walk and was impressed with how happy and sweet he was. In fact, she couldn’t help but love him. But now she faced a dilemma. Here was this energetic bundle of joy who was hard to resist, but she really wanted to wait a month or so before adopting. She left the shelter without him, but that night, she couldn’t stop thinking about him. “I couldn’t stand the thought of someone else coming in and adopting him, so I went back the next day and adopted him myself.” She hasn’t regretted it for a moment. At other times “he gets so excited and hyper he just runs around the apartment in circles,” Erin says. But then he calms down and relaxes behind her head atop the couch cushions. At bedtime he slips under the covers and sleeps by her feet. “I don’t know what I’d do without my little guy now,” Erin says. He’s a perfect fit.